There is a reference to a wild cat hybrid in Harrison Weir’s excellent book of 1889, Our Cats and all about them (note: the title is written exactly as per the original). I am told the book is copyright protected so I can’t quote Mr Weir, except briefly; although, I find it hard to believe it is still protected by copyright. Mr Weir says the cat was a hybrid, and I’ll quote briefly..
Mr Weir was referring to a wild cat hybrid. Was he referring to what, today, we know as the Bengal cat? The answer would be found in discovering the species of wild cat that he refers to as “the wild cat of Bengal”. If this is a reference to the Asian leopard cat, we can conclusively state that the first Bengal cat was born well before Jean Mill cross-bred the Asian leopard cat to domestic cats, and an imported Indian spotted domestic cat, in the 1960s (Bengal cat origins). Mr Weir describes the wild cat hybrid as handsome and very wild. He writes that the hybrids mate with domestic cats. 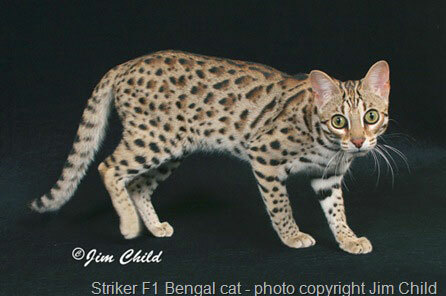 The distribution of the Asian leopard cat, also simply called the “leopard cat”, encompasses Bengal. The leopard cat is very commonplace in the region or certainly was in the 19th century. It was the most common of the small Asian wild cat species being widely distributed from Afghanistan to Northeast China. The scientific name of the leopard cat is Prionailurus bengalensis. Bengal is integrated into its name. I can’t find a definitive statement that confirms that Mr Weir is referring to the leopard cat. However under all the circumstances he probably was, in which case the first Bengal cat, an F1 (first filial), was created well before Jean Mill’s experiment. It is almost certain that many more leopard cat hybrids were born for thousands of years in fact. It is interesting to speculate that Jean Mill read Harrison Weir’s book and got the idea for the Bengal cat from page 55. This entry was posted in Bengal cat, Cat Breeds, Cat History, Cat News, Hybrid cat, Leopard cat, Small Wild Cat Species, WIld Cat Hybrids and tagged asian leopard cat, Bengal cat, cat history, leopard cat, leopard cat range, wild cat hybrids by Michael Broad. Bookmark the permalink. Michael, i first saw the “Okapi”, Komodo lizard and the poison dart frogs at London’s Regent zoo. It is the World’s oldest scientific zoo’s and has many “Firsts” among zoo’s to its credit. “JUMBO’ the famous elephant that has now become a word synonymous with gigantiism was at the London zoo giving joy rides from 1865 to 1882!Definitely the zoo must have had or discovered the first “Bengal Cat” as India was a part of the British empire during that period. Thanks a lot, Dan, for clarifying the copyright issues. I have the hard copy book and the publisher says it is copyright protected but I have always felt it was not because it has expired. I think someone just republished the book and protected their interest by claiming copyright. A British scam 😉 It would not have happened in Harrison Weir’s day.